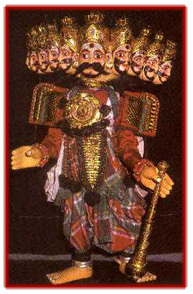 Traditional string puppet theatre from Karnataka in south-west India. Yakshagana gombeyata is performed in the coastal districts in the north of Karnataka. It is based on the traditional dance-drama, yakshagana or “the song of the Yaksha” (celestial beings), which derives from the worship of the bhuta, agrarian divinities nesting in the rice paddy fields of Karnataka in the midst of tiny temples vanishing among mature rice stems. For centuries now, after harvests, rural actors offer sacrifices to these deities and celebrate them by interpreting dance-dramas called yakshagana, staged in dried out paddy fields where sheets are spread on three sides of an imaginary square. The actors spend three to four hours preparing their make-up, donning elaborate and brightly coloured costumes made from layers of textile draperies accented with garlands, jewellery and ornaments made from wood, mirror work and coloured stone, and fashioning gigantic tiara-headdresses by crisscrossing hundreds of coloured ribbons on top of their foreheads. Traditionally, only male actor-dancers participate in this ritual drama. 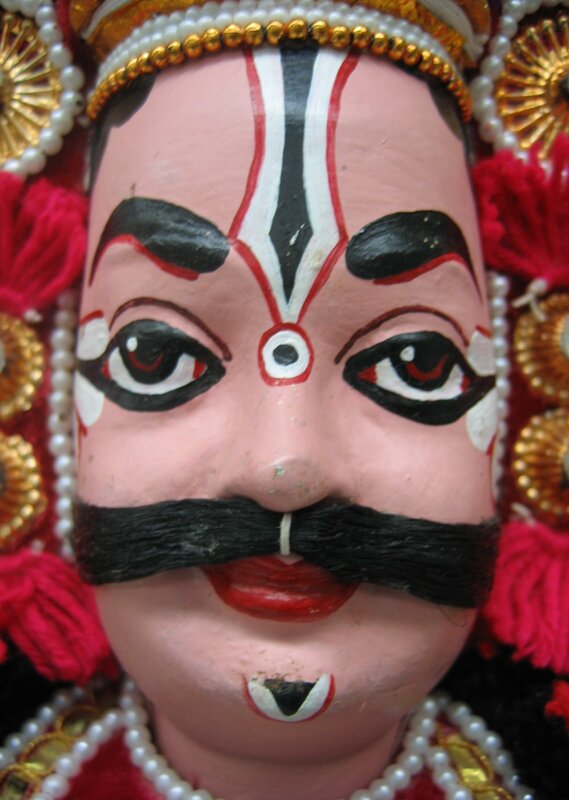 In the middle of the 9th century, the same dramatic dances were performed by large puppets (mentioned in the Puranas), to express the devotion of the villagers who would never tire of watching either the actors or the puppets. 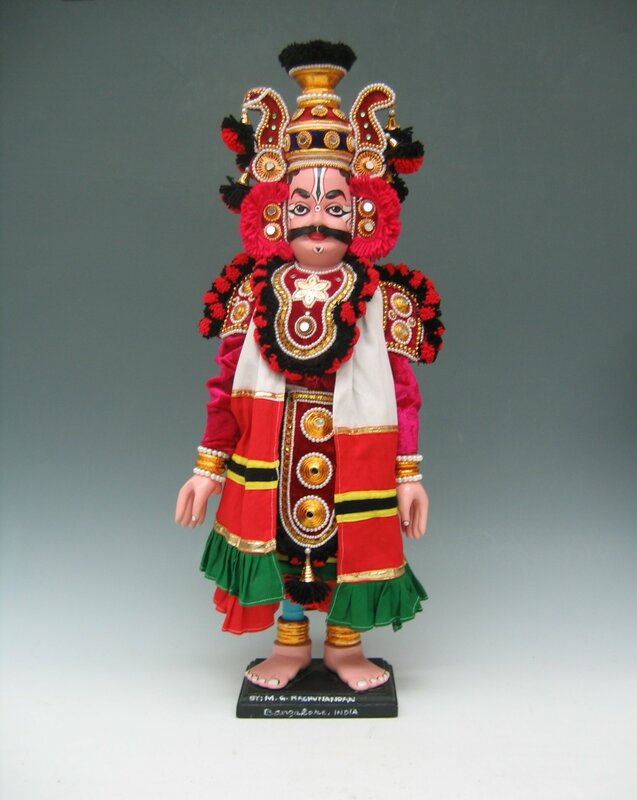 Sculpted in light-weight wood, but not by the puppeteers, the yakshagana gombeyata puppets display a coloured face with a high headdress and articulated arms and legs covered with fabric and jewels. The large square feet, also sculpted, rest on the ground, visible to spectators. Using six strings, the puppeteers manipulate from above the thirty or forty figures necessary for each performance. Sometimes an additional string is added for the manipulation of a sabre, a torch or a horse. Hidden behind black cloth, the puppeteers dance with the puppets. 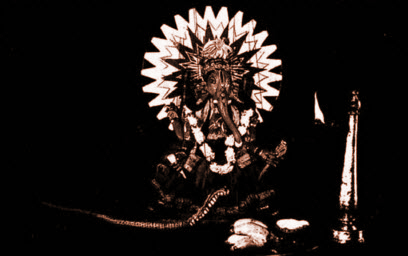 The troupe, directed by a bhagavathar (one who worships Bhagavan, an epithet for God), an imaginative storyteller, dancer, musician and expert manipulator, follows the story sung by a vocalist who is himself accompanied by a musician on the chende (vertical drum) and sometimes by another musician on the madale (horizontal drum). Just like the human yakshagana dance-drama, the puppet yakshagana gombeyata preferably draws on episodes from the great Hindu epic, the Mahabharata, due to the action in the jousts, battle scenes and supernatural apparitions, but also draws from the Ramayana and the Puranas. This puppet theatre suffered through a period of decline after the 16th century and disappeared almost completely. Revitalized during the 19th century, it acquired an international reputation starting only from 1978 thanks to the Festival des Arts Traditionnels de Rennes (4th Festival of Traditional Arts, Rennes), which invited Kogga Kamath (1921-2003), the last master and animator of these puppets, on a European tour. Awarded by the Sangeet Natak Academy, this genre of theatre, with now a proliferation of troupes, the most important of which is directed by Bhaskar Kamath, son of Kogga Kamath, has found considerable renewed interest outside yakshagana gombeyata‘s Kundapura District birthplace. Today, there are troupes and traditional families performing yakshagana gombeyata, some of whom are master puppeteers recognized locally and sometimes nationally for their contribution to the art of puppetry.